It was less than 30 years ago thatApple introduced the world to the Graphical User Interface with itsLisa computer - and a yearlater that Apple unveiled the Macintosh to the world.It was a revolution that would forever change the way we worked withour computers. Instead of typing in commands, which were very pickyabout typos, we would point and click on icons to launch programs andopen files. We would see our word processing documents displayed usingthe typefaces they would be printed in. We could create our ownillustrations using MacPaint, a precursor to Photoshop. 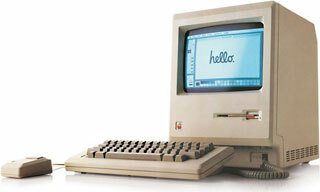 Today our staff looks back to that day in 1984 when Apple rolled outthe first Macintosh. Alan Zisman (Zis Mac): Whenthe Mac was introduced, I didn't pay much attention - I was not yet"hip" to personal computing, and I was a parent with a not-quite-threeyear old daughter and a son who was born a week later. And not being aSuperbowl watcher (or much of a TV watcher in any event), I missed thebuzz over the TV commercial. Within a few years, though, as ateacher, it became clear that personal computers were going to play anincreasingly important role in education - and that the personalcomputer to do that was going to be a Mac. By 1985, I was takingeducation courses to upgrade my teaching credentials; the university'seducation faculty had three computer labs available - an Apple II lab,an IBM PC lab, and a Mac lab. It was clear that the Mac lab was the wayto go. By 1987, the education faculty profs all seemed to be ravingabout HyperCard -and of course that required a Mac. Finally, by 1988 I was ready to take the plunge into personalcomputing. I had a friend who loaned me a Mac (original 128 KB Macupgraded to 512 KB of memory) along with an external floppy drive - andthat was my start. Dan Knight (Mac Musings): I have to admit to being a very earlypersonal computing geek. The guy I worked for bought an Apple II+around 1978, my first two computers were a Commodore VIC-20 and 64, andI followed them with a Zenith Z-151 (upgraded to a Z-158) MS-DOS PC. Icut my teeth on the command line, and I pooh-poohed the Mac's userinterface. When I started using Macs at work, they frustrated me. How did youwrite a batch file? Why was everything so slow compared to DOS. But Igot used to Macs, and around 1990 or 1991 got my first one, anear-end-of-life 1986 MacPlus. It didn't take long to expand it - borrowing a second floppydrive from a coworker, upgrading RAM, getting my own hard drive, movingto System 7, getting ClarisWorks when it first came out. At one point Ieven got a 16 MHz processor upgrade, doubling system performance. Itwas a real workhorse that I used for several years. 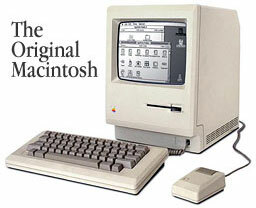 The Mac Plus was a somewhatupgraded version of the original Macintosh. Same 8 MHz 68000 CPU. Samecase and mouse. Same 9" black-and-white display. The Plus had akeyboard with a numeric keypad, used double-sided disks, had a fast(for its day) SCSI interface for adding a hard drive, and was designedwith memory expansion in mind, but the experience wasn't all that farremoved from the original Macintosh. Yes, those 8 MHz Macs were kind of poky, even once you added a harddrive. But they got the Graphical User Interface in the hands of users,creating the only alternative hardware platform from the 1980s tosurvive to the present day, which is still dominated by Microsoft'sOS. Kudos to Apple for making the GUI much more affordable in 1984 andchanging the face of computing for the better. Dan Bashur (Apple, Tech, andGaming): The only thing I have to say is in retrospect-Êsince I was 7 years old when the first Mac arrived on the scene, not tomention that my family's first Mac was an LC. 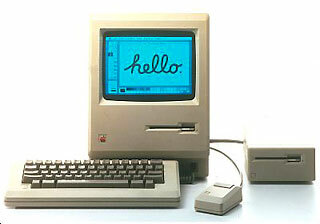 However, over the years I have learnedto appreciate the earliest Macs for starting a revolution in homecomputing. That revolution would begin with the infamous 1984commercial, and the aftershock still resonates today witheverything that Apple has done and continues to do that changes how wemaster our digital world. I must mention that I am currently readingSteve Jobs' biography by Walter Isaacson. It has been an incrediblejourney thus far to see the humble beginnings of what would become themassive super-power of a company it is today - partly in thanks to thedesign, build quality, and simplistic engineering of the original Macand the OS that accompanied it. The original Macintosh was perhaps the turning point that slowlymade Apple one of the most recognized brands on the planet. Despite thefact that cheaply built Windows PCs would dominate the market for quitesome time, the blueprint that the original Mac laid out by creating afriendly (and much more stable) user interface would continue throughMac OS X and iOS and has changed the minds of millions of formerskeptics and critics. Jason Schrader (Maximize YourMac):I vaguely remember getting our first Mac when I was 7 yearsold. What I do remember is playing Tri Fokker Airplanes. It was wireframed flight simulator. It truly was an amazing piece of technology.It was so much smaller than my friends parent's PCs, and it had aninterface instead of typing commands. I remember making pictures usingMacPaint (I actually have one of those drawing to this day). This wasthe first Mac I would ever use, and I have owned, I don't know, maybe20 Macs since then. Computers have come a long way since then - and tothink that I got to see the beginning of it. This will make a wonderfulstory for my daughter some day. "I remember when we had one buttonmice, um . . . well, a mouse is this sort of . . . ah nevermind." The Overpriced Mac in 1984compares pricing and value of early Macs to PCs of the era. 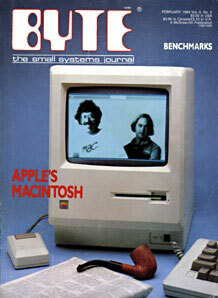 1984: The First Macs looks atthe original 128K Mac and the 512K "Fat Mac" introduced later in theyear. Lost Apple Designsfrom the 1980s shows some design concepts that could have beenMacs.